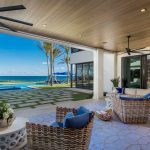 Nestled in Ocean Grande Place, a gated enclave of only 17 homes, 3654 South Ocean Boulevard, Highland Beach is the perfect seaside residence for year-round living, seasonal visits or accommodations for guests. Situated across the street from the private beach access and near the pool, the three bedroom home features formal living room with fireplace, first floor office that could serve as a fourth bedroom, elevator, master suite, private yard with walkways and terrace, covered loggia, generator, built-in grill, laundry room, two-car garage and storage. With brand new multi-million dollar residences located across A1A, Ocean Grande Place is a private community that allows pets and leasing once per year. 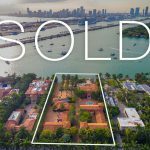 Priced to sell, this is an amazing opportunity to enjoy South Florida’s luxury living. 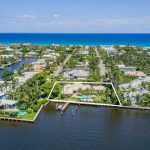 Boasting a South Ocean Boulevard address, this property is located between Delray Beach and Boca Raton’s boutiques and eateries and a pleasant drive along A1A to Palm Beach and Fort Lauderdale. Highland Beach’s town hall is located just north of Ocean Grande Place with a library, post office, water plant, fire department and police department that offers patrol service. The town offers first-class services while maintaining a private and serene coastal community for its residents. 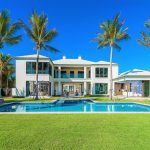 The two-story residence is situated on one of the largest parcels in Ocean Grande Place with private fenced yard, walking paths and a spacious covered loggia. Enjoy the close proximity to the community pool across the decorative drive and pedestrian gate that leads to the private beach easement access with outdoor shower. The brick paver driveway and walkway are perfectly framed by the professional landscape with decorative fountain and outdoor custom lighting. The foyer entry flows to the main living areas with access to the elevator and stairway to the second floor. The formal living room has a gas fireplace and the formal dining room with access to the kitchen has French doors to the private side terrace. The family room has French doors to the walking path and is open to the well-appointed kitchen featuring Thermador, Sub-Zero and Bosch appliances, wine cooler, cooking island, plenty of storage including lined silver drawers, dining area and access to the back terrace and built-in grill. The first floor office could easily be converted to a fourth bedroom with closet and a full bath just off the hallway. The two-car garage is easily accessed off the dining room and has an extra refrigerator and stackable washer and dryer. The second floor has a spacious landing area with morning bar making it the perfect spot for viewing tv or a sitting area or office. The master suite is located off the landing and offers a large master bedroom; two separate walk-in closets with custom lined jewelry drawers; and a lovely master bath with glass shower, Jacuzzi tub and double vanities. There are two additional guest bedrooms with full baths and walk-in closets. The laundry room is located on the second floor with a laundry sink and full size washer and dryer. Situated on one of the largest Ocean Grande Place parcels, this property boasts a fenced yard with east side terrace, built-in grill, landscaped walking paths and a serene and private covered loggia with plenty of space for outdoor dining, lounging and entertaining. Sun and fun are easy with the community pool nearby and pedestrian gate leading to the private beach easement access across A1A with an outdoor shower. Many upgrades and amenities include custom lighting for art displays; LED lighting; elevator; custom stairway railing; interior and exterior security cameras; full-house generator; electric hurricane shutter for front entryway; impact glass on entire front of house; folding shutters on non-impact windows; under stair storage closet and large attic space; sprinkler system; central vacuum; two-zone air-conditioning system new in 2016; laundry facilities on first floor and second floor; new gutters; new awnings; retractable awning off family room; fenced yard for privacy and pets; and two-car garage with hurricane proof garage door and new flooring. This is the perfect opportunity to enjoy year-round living or seasonal South Florida getaways. 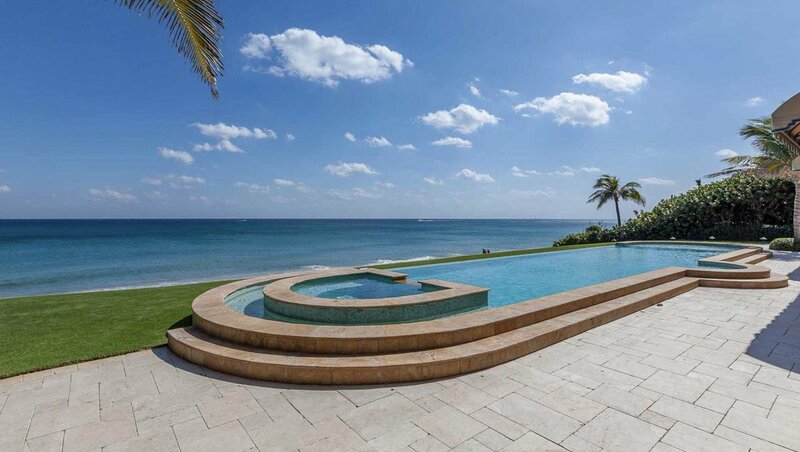 With an appealing price, the residence could also serve as an extraordinary guest house for nearby oceanfront owners. The possibilities are endless! South Florida’s luxury lifestyle awaits at Ocean Grande Place. Contact Nick Malinosky for more information about this Ocean Grande Place residence located at 3654 S Ocean Blvd, Highland Beach.